The recent visit of the Indian Prime Minister, Narendra Modi, to Australia and other countries to participate in the G20 Summit has raised eyebrows of many international leaders. His speeches at the G20 Summit and the Australian Parliament has promoted the image of India among the world leaders. After Obama, Modi was the much sought after leader for individual meetings by many leaders. The visit of an Indian Prime Minister to Australia after 28 years has raised hopes among the Indian Australian community. Six hundred volunteers, mainly youth, worked for nearly two months non-stop to arrange the big event in Sydney, where Modi spoke. More than 21,000 people attended the meeting, addressed by Modi in the evening of the 17th of November, 2014. A special train named 'Modi Express' was run between Melbourne and Sydney to enable people to attend the Modi speech. Besides, a large number of native Australians too attended the event. Gujarati Muslims, dressed in traditional attire, were also present at the event. The following day, Modi had addressed 500 top business leaders at Melbourne. This event was organised by the Australia India Business Council. Accompanied by cricket legends like Kapil Dev, Gavaskar, and VVS Lakshman, he unveiled the ICC World Cup 2015 Trophy in the presence of the Australian Prime Minister, Tony Abbott at the Melbourne Cricket Club (MCG). During his visit to Australia, Modi generated the 'Modi Fever' among all including the media, in the entire country. He presented to them a new vision of India that combines nationalism with modernity. When Modi spoke, the world leaders listened to him. The local media described Modi’s visit as a grand success. It is opined that even Obama’s visit did not create such an impact. More than a political leader, he proved himself to a 'rock star', attracting the attention of everybody. 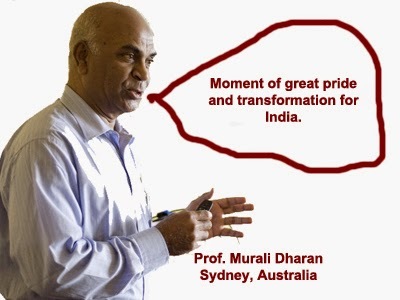 On behalf of Primepoint blog, K. Srinivasan interviewed Prof. Murali Dharan, an Indian Australian, living in Sydney for more than 30 years. The interview was conducted through email. Prof. Murali is a senior Management Professor and also the Chair of the Education Industry Chapter of Australia India Business Council, which had organised Modi’s Melbourne meet with top business leaders. Q: This is the first time after 28 years that an Indian Prime Minister has visited Australia. What is the feeling about this among the Indians there? Australia for 28 years and all were excited when he arrived. PM Modi is a man with a mission. He showed great leadership, friendship, common-touch and a great sense of humour, to capture the hearts and minds of the Indians and the Australians in Australia. Every paper carried the news about him on the front page. Several of them described his visit as 'sensational', 'rock-star performance' etc. It is not just a mass popularity. Many economic and business professionals too believe that he has struck the right agreements and partnerships to deliver great trade, business and other mutual benefits for people of India and Australia. Q: There were many international leaders during that time. What did the Australian Government and the people there feel about the visit of the Indian PM. How did they view Modi? A: Modi is seen as a special leader, since he represents the largest democracy, the third largest economy and the emerging superpower. Due to his charisma and friendliness with the Australian PM, Tony Abbott, the Australian PM addressed Modi several times, using his first name, Narendra. The positive vibes between these leaders were reflected during their joint participation in the G20 sessions, joint sitting of the Parliament and the Melbourne Cricket Ground with cricketers. Modi is seen as a great leader with a 'Can-Do' attitude, who can transform India, cut down bureaucracy and improve conditions. For instance, Modi announced that all Australians would get the Visa-On-Arrival, thus cutting down a major hurdle for many Australians wanting to visit India. Modi also signed 5 major treaties, including a joint military and security cooperation treaty with Australia. This is a critical step in regional security, which could be aimed at containing China. Q: As a management professor, do you feel that this visit of the Indian PM will help improve the relations and trade between the two countries. How does India stand to gain? A: India should gain substantially from this visit, most definitely in the business, trade and investments by Indians. Several Indian business leaders accompanied Modi and engaged with their Australian counterparts. Indian students, arts and culture will stand to benefit immensely, with Modi promising to open an Indian Cultural Centre in Sydney by February, 2015. People to people engagements will increase considerably. Australian minerals, especially coal, gas, and uranium will provide the fuel to fire the engine of India's economy for several decades, delivering energy security for India. There is no doubt that skilled Indian youth will deliver services in all sectors of Australia for years to come. This is a win-win situation for both the countries. Q: How do you rate Modi as a communicator, when compared to other international leaders? A: He can be described as a practical Indian leader with the common touch but with the image of a rock-star abroad! A great communicator as he changes the pitch of his voice to the audience, he proved himself a great statesman in the Australian Parliament, while coming across as a common man when speaking to the Indian diaspora. He spoke about the day-to-day problems (peppered with lot of humour) and told how he intended to resolve them. As he stood with the Australian leaders, he was a visionary leader of 1.2 billion people! Q: Can you describe your experience and feeling about Modi visit, in a single sentence? A: Moment of great pride and transformation for India. Please watch this rendering of the national anthem of India, Jana Gana Mana by 20,000 people at the Olympic Arena in Sydney. This was filmed by me with a small camera!